School of Traditional Chinese Medicine, Guangdong Pharmaceutical University, Guangdong, CHINA. 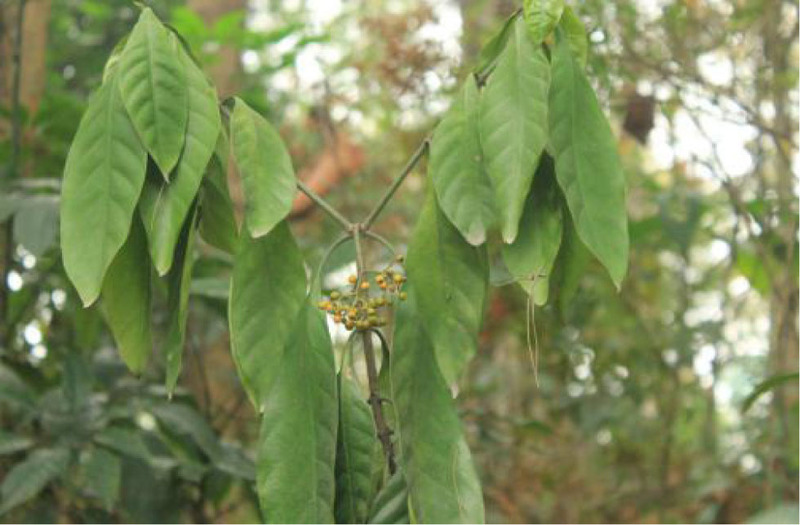 Various traditional systems of medicine enlightened the importance of Psychotria rubra (Lour.) Poir to have a great medicinal value. The present study was carried out to provide a scientific basis of the identification and the authenticity of Psychotria rubra (Lour.) Poir with the help of pharmacognostic parameters, which is not done before. Roots, stems, and leaves of P. rubrawere collected for Pharmacognostic studies involving macros, microscopic evaluation, histochemistry and physicochemical parameters analysis like Ash value, Moisture content, Fluorescence analysis and Thin Layer Chromatography et al. Transverse section of root was found like stone cells, calcium oxalate crystal and vessels in circular shape. Transverse section of stem showed the presence of lenticels and stone cell bands. Transverse section of leaf vein revealed the presence of shaft type of porosity. Powder microscopy revealed the presence of cork cells, stone cells, crystals and resin, fibers, needle crystal beam, thread tracheid and scalariform tracheid. Phytochemical investigation was found like alkaloids, flavones, carbohydrates, saponins, tannins and volatile oils. Results obtained in physicochemical parameters like Total ash value, acid insoluble ash and moisture content were 9.77%, 0.68% and 1.28%, respectively. The leaching degree of P. rubra was higher in ethanol(75%, v/v) and methanol solutions than that in chloroform, petroleum ether, and tetrachloromethane solutions. Thin Layer Chromatography (TLC) of the extract revealed 4 spots with the Rf values 0.47, 0.46, 0.46, 0.47 with the solvent system of chloroform: methanol: water: formic acid(7:3:1:0.1). The observations confirmed that P. rubra has an obvious Pharmacognostic characteristics, which will be useful towards providing a reliable basis for identification, purity, quality and classification of the plant. Psychotria rubra(Lour.) Poir, a medicinal plant locally known as “shandayan”, belonging to the genus Psychotria L., family Rubiaceae, is a small evergreen shrub with a height of 0.5-5 meters tall, which widely distributes in tropical and subtropical regions of Asia such as Ryukyu Islands, Taiwan, South China, and Indochina.1 Normally it grows up in warm and wet environment where the altitude lies from sea level to 20-1500 meters.2 The leaves are elliptic-oblong, lanceolate-oblong, or rarely oblong-ovate in shape, measuring 5-23.5 cm long and 2-9 cm wide, apex acuminate to acute, base acute to obtuse, margins flat to narrowly revolute, petiole ranges the length from 0.7-5 cm long. Inflorescences are cymose to paniculiform. 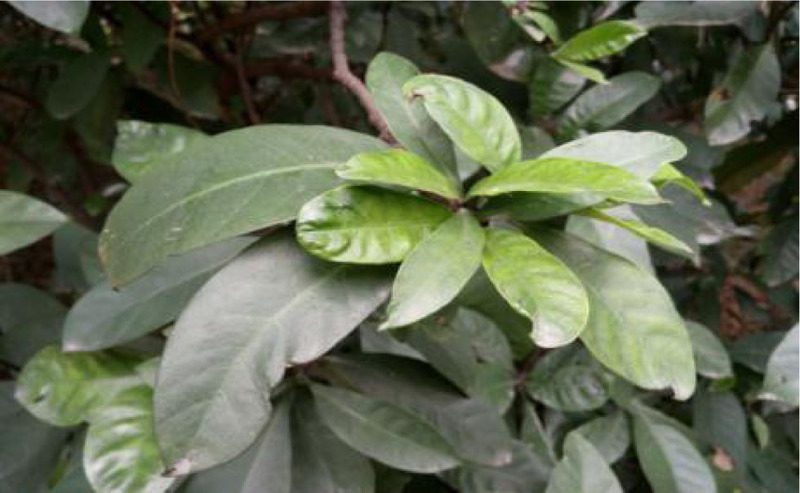 There are also many distributions on the forest floor in southwest and east China.3 P. rubra has been highlighted the use of its roots, stems and leaves as Traditional Chinese Medicine for the treatment of numerous ailments like cold, diphtheria, dysentery, injury and nameless pain.4 In addition, the extracts of P. rubra have been confirmed having anti-oxidation or anti-inflammation effect and preventing and treating obesity-related diseases.5 The chemical composition and efficacy of extracts from P. rubra were intensively investigated in previous studies. Many new chemical compositions from the volatile oil and ethanol extractive fractions of this plant have been isolated and their structures elucidated.6,7,8 As for its Pharmacological activities, it was reported that different extractive fractions of P. rubra showed different efficacy such as anti -depression (ethanolic extract) or improvement on learning and memory (ethyl acetate extract).9,10,11,12 However, the information regarding its identification of the authenticity is very scanty and poor understood for such studies have not been carried out. 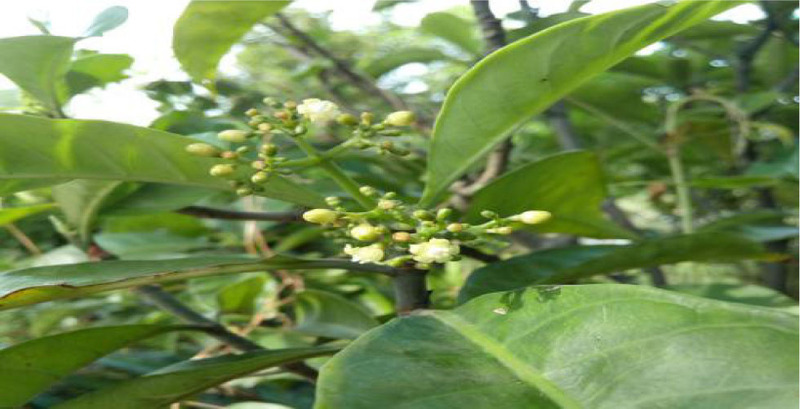 As the drug is endowed with huge exploitation and utilization value, it is medicinally important to know precisely and comprehensively about its characteristics of pharmacognosy. In view of importance of knowing about the genuineness of this plant, herein we made a detailed investigation on macroscopic, microscopic characters, histochemistry, physicochemical parameters and fluorescence analysis, and powder analysis of its roots, stems and leaves to help in identification and standardization of this drug. Fresh plants of P. rubra were collected from Guangzhou University of Traditional Chinese Medicine, Guangzhou Higher Education Mega Center, taxonomically identified and authenticated by Prof.Shengguo. Ji, School of Traditional Chinese Medicine, Guangdong Pharmaceutical University. They were washed and cleaned by flowing water to remove the physical impurities, air-dried under shade, made into a coarse powder using a mechanical blender and preserved in hermetic container with dry air for pharmacognostic study. The organoleptic and macro morphological characters of fresh material including color, shape, size, texture and fracture were studied and noted. Fresh material fixed with the FAA was subjected to histologic study. Sliced by paraffin section method, the thin hand cut sections of roots, stems and leaves were dehydrated in a series alcohol concentration, followed by staining with safranine-fast green and mounting with neutral resin.13 The powders of the drugs were separately treated with glycerine (50%, v/v) and chloral hydrates (10%, v/v) for microscopic study. Microphotographs were taken by observing the free hand sections under Motic Multi-plexer attached to the microscope. All important features were detected and recorded suitably. The powdered sample of P. rubra about 3 g was weighed in a tared silica crucible to incinerate until free from carbon. Gradually increased the temperature to 500-600°C until constant value was obtained. Dilute hydrochloric acid about 10 mL was measured and added to the total ash obtained above in a silica crucible, which was covered with watch glass with water bath heating for 10 minutes. Filtered and residue was washed until the lotion does not show an oxide reaction, dried and burn until constant value was obtained. Moisture content of powders was determined by weighing 2-5 g of powder sample in a weighing bottle dried to constant weight and then placed the weighing bottle in hot air oven at 105°C for 1 hour until constant weight of sample was obtained. 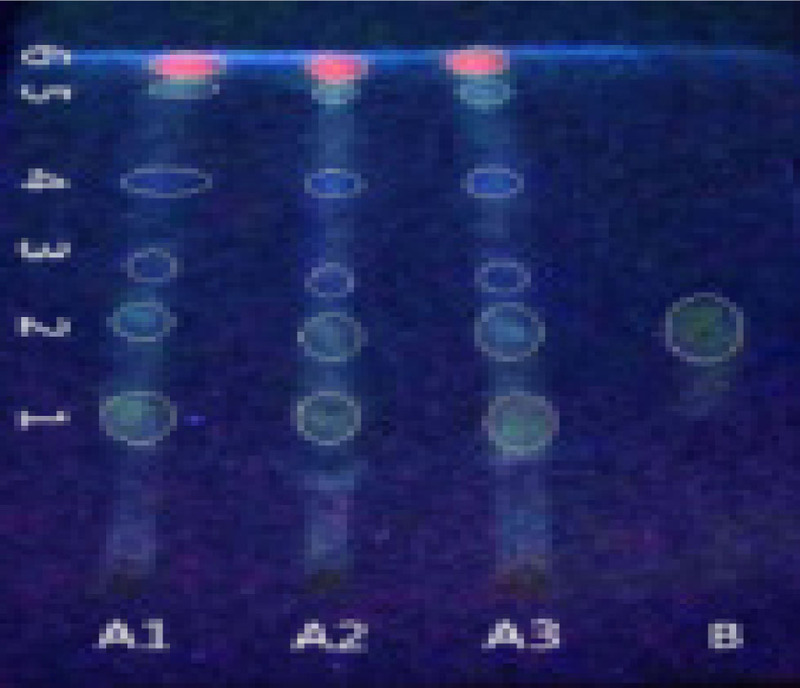 Fluorescence analysis was carried out by treating the powdered drug with different reagents, namely ethanol (75% v/v), ethyl acetate, acetone, methanol, chloroform, carbon tetrachloride, water and petroleum ether and observed at 254 nm, 366 nm in a UV chamber and visible light. Leaching degree was determined by treating the powdered drug with different reagents, namely ethanol (75% v/v), ethyl acetate, acetone, methanol, chloroform, carbon tetrachloride, water and petroleum ether. Filtered and filtrate was evaporated to obtained dried extract. Thin Layer Chromatography studies were carried out for themethanolic-petroleum ether extract of P. rubra and reference sample Rutin. The spots obtained from both the extracts were examined under ultraviolet light, of wavelengths 365 nm. An aluminum plate(20×10 cm) precoated with CMC-Na(0.5%)-silica gel GF254 was used as the absorbent. The solvent system was chloroform: methanol: water: formic acid(7:3:1:0.1). The methanolic-petroleum ether extract of P. rubra was prepared by using 5 g powder, treated with 100 mL of methanol, filtered and decolor with petroleum ether. The plate was developed in a Camag twin trough chamber and examined at 365 nm. Fresh plant: P. rubra is a shrub or small tree with a height of 0.5-5 meters tall. 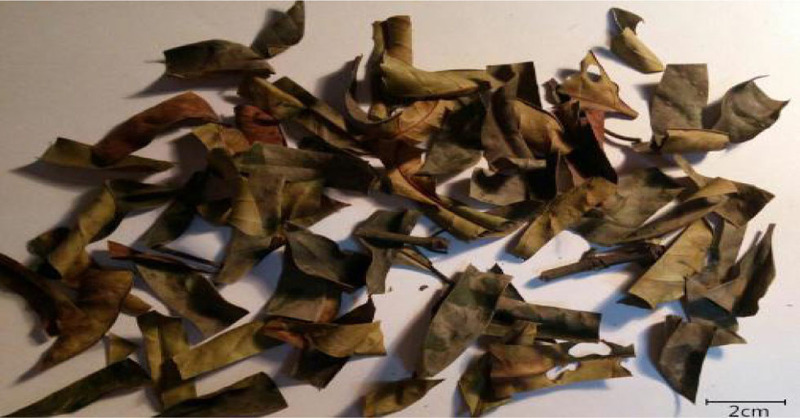 Leaves are elliptic-oblong, lanceolate-oblong, or rarely oblong-ovate in shape and opposite each petiole, drying papery to leathery, measuring 5-23.5 cm long and 2-9 cm wide with entire margin and acute apex. The color is green when fresh, while in dry condition, upper surface is yellowish green or gray-green color whereas underside is dark red or brownish red color. Petiole is glabrous or rarely puberulent. Stipules are membranous and caducous with short sheath shape, broadly rounded to obtuse or shallowly emarginate (Figure 1A). The inflorescence is terminal or sometimes pseudoaxillary, cymose to paniculiform, many-flowered. Flowers are glabrous or usually densely puberulent, sessile and apparently tripartite to shortly pedunculate. 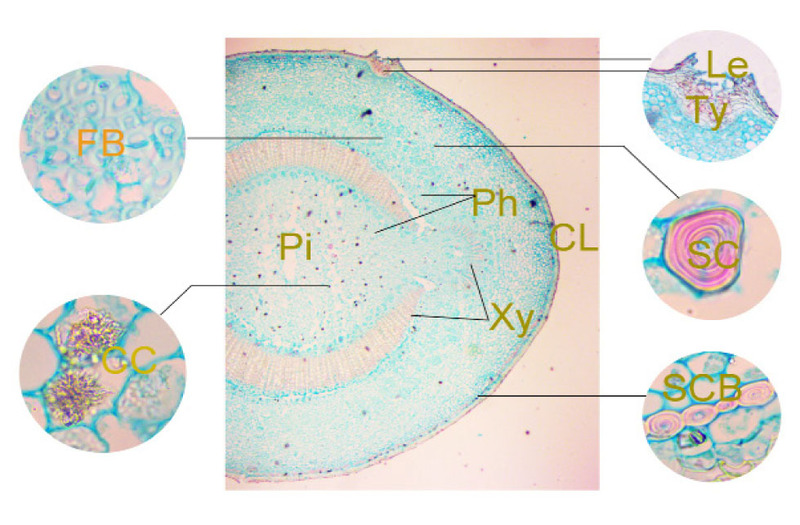 Peduncle is very short about 0.3 mm and branched portion is corymbiform-rounded to broadly pyramidal, with 1-3 pair(s) of developed secondary axes. Corolla is white with funnel form, glabrous outside (Figure 1B). Fruits are drupes which are red in color, subglobose to broadly ellipsoid with a length of 5-8 mm, diameter 4-7 mm, with pedicels to 10 mm (Figure 1C). Dried plant: Stems are brownish black in color with cylindrical shape, easy to break up by hand. Fracture surface is not flat and fabrous. It has an mild aromatic odor and a light taste. Leaves are oblong in shape and bronzing or pinky in color with no wrinkle, lenticel and plush whereas with membranous leaves (Figure 1D). Fresh plant of Psychotria rubra. Dried plant of Psychotria rubra. Epidermis: The upper epidermis cells are squarish-shaped form without nonglandular hairs and stomatas (Figure 2A), while the lower epidermis cells are polygonal-shaped form with stomatas, which are paracytic type, surrounded by two to three subsidiaries (Figure 2B). T.S. of root: Transverse section of root is circular in outline consisting of epidermis, cortex, and vascular zone. The epidermis is broken and obliterated. Cork layer is incorporated in many layers of cells and phelloderm is not conspicuous. Fiber bundles and stone cells are scattered in cortex, with thin walled parenchymatous cells surrounded by calcium oxalate crystal. The secondary phloem is narrow, made up of polygonal-shaped cells, densely arranged. Xylem is surrounded by interfascicular cambium which is less distinct. Xylem rays are conspicuous, and the vessels are circular, most of which are arranged in single or V-shaped (Figure 3). T.S. of stem: Transverse section of stem is oblong in outline consisting of epidermis, cortex and well-developed vascular zone. Cork layer is cuticularized and strongly lignified with a layer of tidily and closely arranged cells and a thicker wall. Lenticels can be seen occasionally and phelloderm is conspicuous. Cortex is made up of loosely arranged parenchymal cells in oblong shaped, measuring one half of the transverse section range the length from 140.95-150.66μm. The lateral vascular cylinder in dorsal ventral side is surrounded by many fiber bundles in cortex, with diffuse stone cells and calcium oxalate rosette crystals. Stone cell bands intermittently in ring measuring 21.56μm in diameter and many diffuse calcium oxalate rosette crystals can be seen between cortex and cork layer. The lateral vascular cylinders in dorsal ventral side are more developed than that in ridges. Four vascular cylinders are dependent to each other, connected to xylem. Vascular bundle in the column is bicollateral. Phloem is narrow with smaller cells, sieve tube bundles and diffuse stone cells. Cambium between the beam is not distinct. Xylem developed to half-moon shaped with strong lignified xylem rays measuring 514.16-736.81μm long and vessels measuring 67.25-99.21μm in diameter. At center, pith is slightly hollow with diffuse stone cells (Figure 4). T.S. of Root. 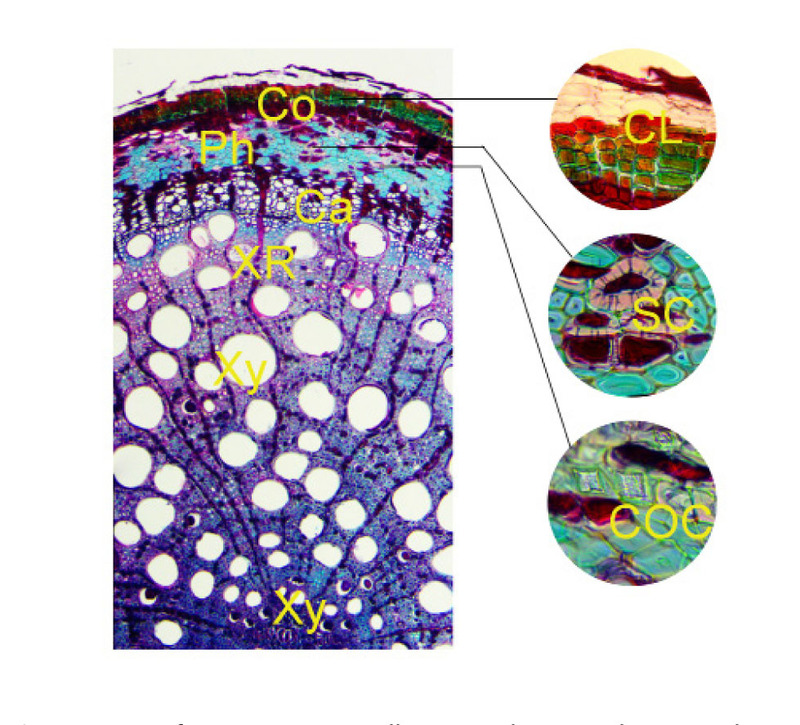 SC: stone cells; COC: calcium oxalate crystals; CL: cork layer; Co: cortex; Ph: phloem; Ca: Cambium; Xy: xylem; XR: xylem rays. T.S. of Stem. Le: lenticels; Ty: tytosis; FB: fiber bundles; CC: cluster crystal; Ph:phloem; CL:cork layer; SC: stone cells; SCB: stone cell bands; Pi: pith; Xy: xylem. T.S. of leaf vein. 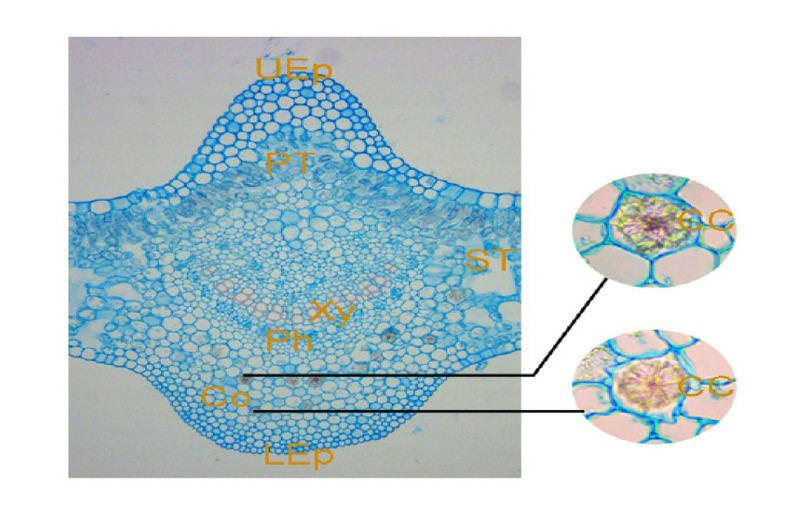 UEp:upper epidermis; PT: palisade tissue; ST: spongy tissue; Xy: xylem; Ph: phloem; CC: cluster crystal; Co: collenchyma; LEp: lower epidermis. T.S. 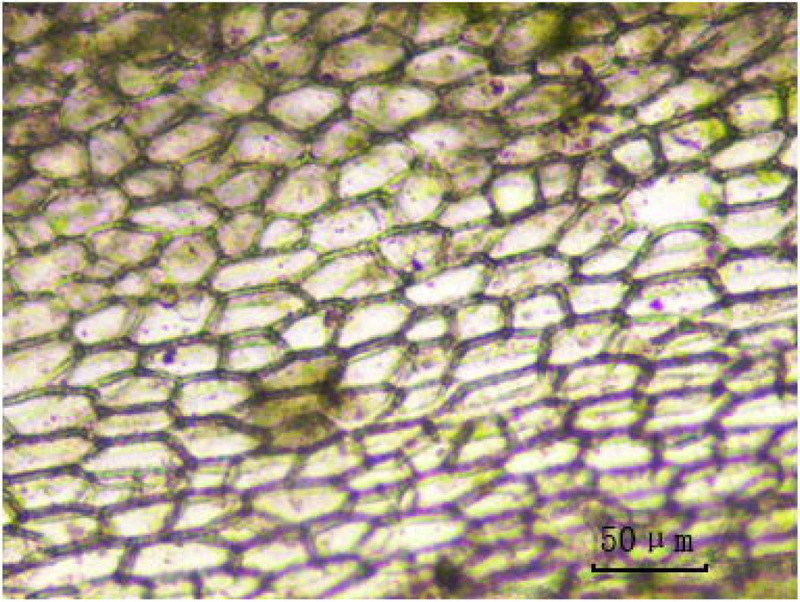 of leaf vein: Both the upper epidermis and lower epidermis of main vein consist of a layer of tidily and closely arranged cells in circular-like shape covered by cuticle, while the upper and lower epidermis of mesophyll are made up of a layer of tidily and closely arranged parenchymatous cells in squarish shape. The palisade tissue of mesophyll is differentiated from the spongy tissue. Palisade tissue, composed of 1-2 layer(s) of short cylindrical-like cells, across the main vein, while spongy tissue cells are circular-like in shape, loosely arranged with bigger gap. Vascular cylinder of main vein is bicollateral, composed of several layers of circular-like cells which are compactly arranged in a ring. Outside the vascular cylinder, parenchymatous cells are small and compactly arranged with diffuse calcium oxalate crystal, while upper and lower sides are surrounded by several layers of collenchymas. Phloem is narrow with compactly arranged cells in polygonal shape(Figure 5). Powder analysis: Microscopic study of powder (Figure 6) reveals the presence of stone cells, cork cells, needle crystals, resin duct, pollen grains, tracheid and vessels. Most of vessels are spiral shaped ranges the length from 31.2-56.4μm. Cork cells are rectangle in shape with thick wall. Stone cells are rare and oblong-like shaped with thicker wall and obvious cinclides. Fibers are multiple gathered, yellowish green in color and slender in shape with thick wall and obvious pits. Needle crystals are smaller and long fusiform with blunt end, diffused into single one or fascicles. Preliminary qualitative phytochemical screening of water and petroleum ether soluble extract of P.rubra showed the presence of carbohydrates, saponins, tannins and volatile oils. Ethanolic extract showed the presence of flavones, while acid-water soluble extract showed alkaloids (Table 1). Physio chemical analysis revealed that moisture content is 1.28 %, total ash content is 9.58% and acid insoluble content is 0.65 %, respectively(Table 2). Fluorescence analysis of powder and different extracts of P. rubrawith different reagents were carried out to observe the color reactions (Table 3). Leaching degree results were tabulated in table 4, which revealed that leaching degree of ethanol(75%, v/v) and methanol extracts from P. rubrawere much higher, whereas much lower in chloroform, petroleum ether and carbon tetrachloride extracts(Table 4). 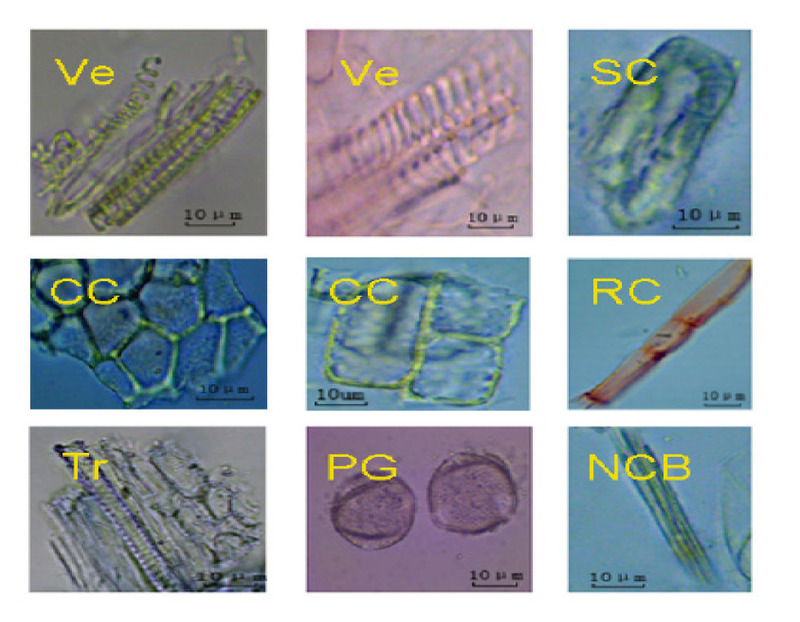 SC: stone cells; CC: cork cells; NCB: Needle crystal bundles; RC: resin canal; PG: pollen grains; Tr: tracheid; Ve: vessels. TLC of P. rubra: A1, A2, A3-sample, B-standard. The TLC profiles of P. rubraextract and Rutin standard were obtained under UV 365nm light after post-derivatization with AlCl3. Figure 7 showed the flavone spot in P. rubraextract specifically (Figure 7). Distinct TLC spot on the silica gel plate representing isolated compound with specific Rf values (Rf = 0.47). The standardization of a crude drug is of key importance in establishing its proper identity, also plays an imperative role in guaranteeing the botanical quality and clinical efficacy. Before any crude drug can be included in a herbal pharmacopoeia, it is prerequisite to establish pharmacognostic parameters and standards based on macro and microscopic evaluation as well as detection of adulterants and substituents. However, the leaves, stems and roots of this plant were used by local people for the treatment of various disease without standardization. The study provided some basic data regarding the genuine crude drug. The stone cells, calcium oxalate crystal, vessels, lenticels, crystal and resin, fibers, needle crystal beam, thread tracheid and scalariform tracheid were observed under the microscope which were used as ingredients. All the physicochemical parameters such as total ash value, acid insoluble value and moisture content were analyzed and found to be within limit mentioned by Pharmacopoeia of China. Fluorescence analysis and thin layer chromatography, like parameters above, are unique to the plant and are required in its standardization. Such information of the pharmacognostical evaluation may be useful to identity of P. rubrawhich may act as reference information and produce a solid basis for proper identification, authentication, collection and investigation of the plant material. Further, it will be helpful for detecting adulterants and substituents and maintaining the quality, reproducibility and efficacy of natural drugs. 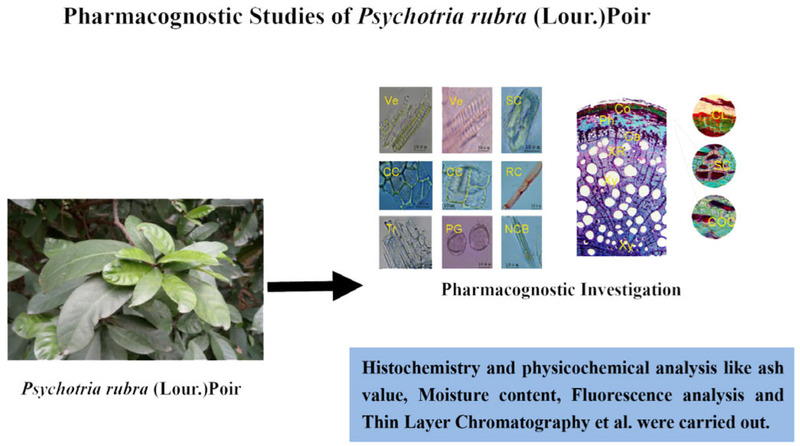 The present study was carried out to made a detailed investigation on pharmacognostic parameters of Psychotria rubra (Lour.) Poir to help in identification and standardization of this drug. Morphological and microscopic characters of the roots, stems and leaves of the plant were observed. The histochemistry and physicochemical parameters were studied including ash value, moisture content, leaching degree, fluorescence analysis and Thin Layer Chromatography. T. S. of root showed stone cells, calcium oxalate crystal and vessels in circular shape. T. S. of stem showed lenticels and stone cell bands. 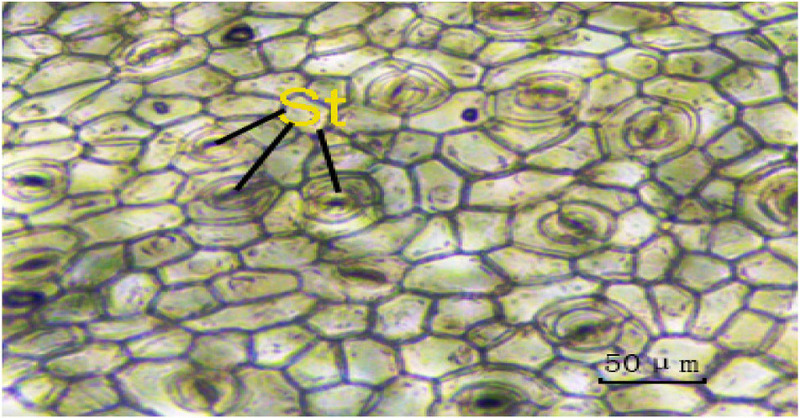 T. S. of leaf vein revealed the presence of shaft type of porosity. Powder microscopy revealed the presence of cork cells, stone cells, crystals and resin, fibers, needle crystal beam, thread tracheid and scalariform tracheid. Phytochemical investigation was found like alkaloids, flavones, carbohydrates, saponins, tannins and volatile oils. Physicochemical analysis showed total ash value, acid insoluble ash and moisture content were 9.77%, 0.68% and 1.28%, respectively. Fluorescence analysis and thin layer chromatography were unique to the plant and required in its standardization. 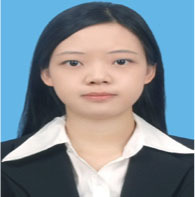 Gengqiu Tang: Key Laboratory of State Administration of Traditional Chinese Medicine for Production & Development of Cantonese Medicinal Materials, School of Traditional Chinese Medicine, Guangdong Pharmaceutical University, China. 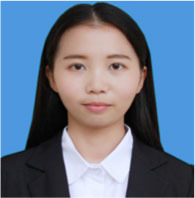 Xiaojing Lin: Key Laboratory of State Administration of Traditional Chinese Medicine for Production & Development of Cantonese Medicinal Materials, School of Traditional Chinese Medicine, Guangdong Pharmaceutical University, China. 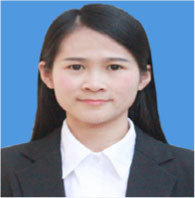 Xiudi Lai: Key Laboratory of State Administration of Traditional Chinese Medicine for Production & Development of Cantonese Medicinal Materials, School of Traditional Chinese Medicine, Guangdong Pharmaceutical University, China. Xue Gong: Key Laboratory of State Administration of Traditional Chinese Medicine for Production & Development of Cantonese Medicinal Materials, School of Traditional Chinese Medicine, Guangdong Pharmaceutical University, China. 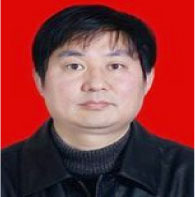 Prof. Shengguo Ji: Obtained his Ph.D degree from Fudan University in Shanghai, China, in 2007, and was rewarded Professorship of pharmaceutical sciences in 2011. He is currently working as Professor in Guangdong Pharmaceutical University, and in the area of Pharmacognostic Sciences, Near Infrared Spectroscopy, Innovative Traditional Chinese Medicine and DNA barcode identification of Chinese medicinal materials. He has published more than 100 research papers in International and National journals. 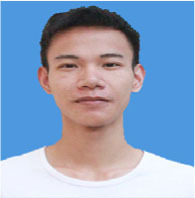 At present, 8 post graduate students are working under his supervision. Authors are sincerely thankful to Guangdong Pharmaceutical University for providing necessary facilities and encouragement to carry out the work successfully.